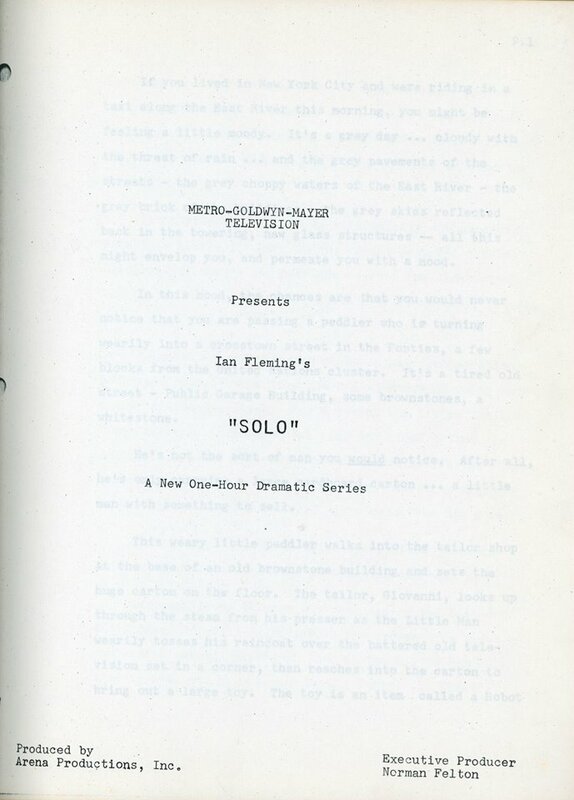 Title page to proposal for “Ian Fleming’s Solo,” which would emerge as The Man From U.N.C.L.E. In 1963, producer Norman Felton was attempting to launch a new adventure television series. In the fall of 1962, he had a few days of meetings with Ian Fleming. The James Bond author had provided some ideas, but little else. Felton turned to writer-producer Sam Rolfe, who was working on Felton’s The Eleventh Hour dramatic series about psychiatrists. Rolfe had also co-created (and produced some episodes of) Have Gun-Will Travel, a popular 1957-63 Western series about a bounty hunter known only as Paladin. Giovanni watches the demonstration but isn’t interested in a purchase. The peddler packs up. Giovanni returns his attention to his pressing machine. But the peddler takes out a second toy robot before departing. The peddler re-enters, followed by five other men. A raid commences. The peddler finds a hidden button in the pressing machine. The invaders use a coat hook in one of the “shabby ‘try-on cubicles.” They gain entry to….what? “On the far side of the wall is a small, modernistic, windowless office. A desk, with a desk plate inscribed ‘U.N.C.L.E.’, is occupied by by an attractive Young Woman who is frowning at a small TV viewer.” On the “viewer-picture” is the inside of the peddler’s coat. The attackers overcome the woman before she can sound an alarm. The peddler remains in the tailor shop, now posing as Giovanni. Eventually, the intruders are tripped up. They use identification badges, unaware they have to be deployed in a certain way without the alarm system going off. Two men, identified as the Leader, the other as an Accomplice make their way through the mysterious facility. 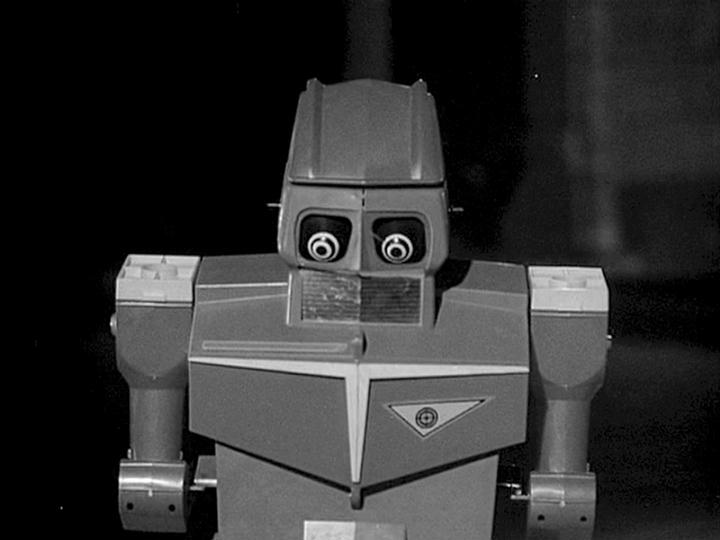 The Accomplice is holding glass balls like the ones the toy robot used. “The Accomplice’s hand is shattered by a spray of bullets, the glass balls splintering in the mangled fingers.” He’s overcome by the gas coming from the broken glass balls. They are soon addressed by a “pedantic looking, fifty-five year old man” who enters the office. He chides the dark man, whom he addresses as “Mr. Solo” about killing the Leader. The men discuss how much information the intruders must have had to get this far into U.N.C.L.E. headquarters. They must have had information from someone working inside U.N.C.L.E.’s Section Three — where there would be enough information to get here but not enough to totally avoid the alarm system. However, we’re then told even the captured intruders died because they had ingested poison before the raid. They were dead men whether they succeeded or failed. “But let us leave this story for a while. Later we’ll come back to it and tell you what happened after this opening,” this section of the presentation concludes. Sam Rolfe (with guest star Jill Ireland), making a cameo appearance in the first-season UNCLE episode The Giuoco Piano Affair. Rolfe would take over and do the heavy lifting on devising the series. The third floor is “a sedate suite of offices, the entrance to which bears the engraved letters ‘U.N.C.L.E. '” The offices have “ordinary” people who handle mail and greet visitors. All of the buildings involved are owned by U.N.C.L.E. Inside the walls of brownstones is “one large building consisting of three floors of a modern, complex office building…There are no staircases in the building. Four elevators handle vertical traffic.” There is an underground channel leading to the East River. Within headquarters, a red badge “will admit you to the ground floor which contains personnel and equipment for day in, day out routine operations.” Trying to get above the floor with a red badge will sound off alarms. The proposal presents an organizational chart. The enforcement agents enter through the Giovanni tailor shop, while other personnel take other entrances. Napoleon Solo: The character named by Ian Fleming during his meetings with Norman Felton. He has an apartment that overlooks the East River. He has “a somewhat coppery kitchen (he cooks).” This was one of the ideas that Fleming contributed in his meetings with Felton. Solo also “fought in a war which was called a ‘Police Action. 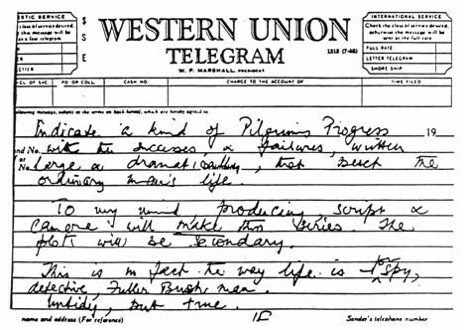 '” While attending a university, he majored in philosophy and minored in languages. The only window in U.N.C.L.E. headquarters in Allison’s office, which has a view of the East River and the U.N. Building. Allison “appears to be humorless. That’s not the case, but Allison doesn’t show it. Allison also doesn’t hesitate to send agents on missions that may end in their deaths. 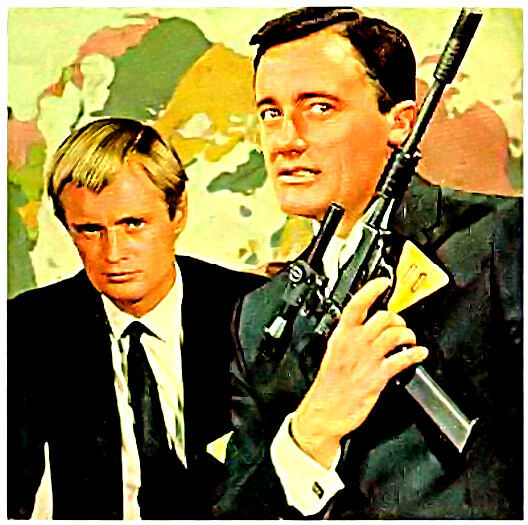 Kuryakin “is of Russian origin. It is wise for U.N.C.L.E. to draw agents from behind the iron curtain.” The agent “maintains an austere apartment in the same building as Solo.” Kuryakin has entrusted Solo with one secret — a hidden compartment under his bed filled with jazz records. Ian Fleming sells off his interest in UNCLE. “Crime, by its large scale nature, is international in scope.” As a result, according to the proposal, the Mafia “and all its attendant ramifications are all basic material for assignments. But it will be treated in a bizarre and interesting manner.” The proposal also cites the example of a deposed Middle Eastern ruler who is forming an international crime empire. 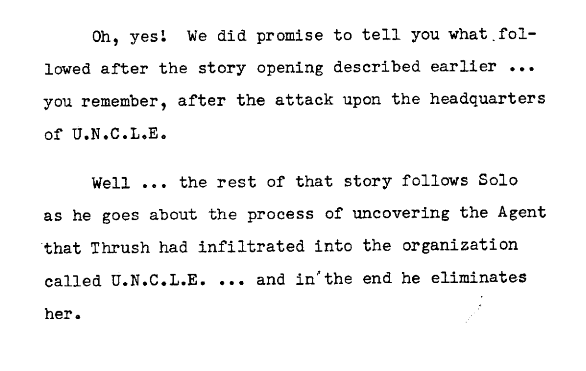 But the recurring opponent is Thrush, a mysterious organization “shaped somewhat like a darker convolution of U.N.C.L.E. … a Dr. Moriarty and his friends would make a fair analogy.” The proposal says, “Thrush himself (and we will refer to him as if he were a single, male entity) is an unknown cipher.” Thrush may hire out or strike and his/its own depending on the situation. A key part of the series is that ordinary people get involved with the agents. The audience “will be made to identify with those caught up in the plots.” The proposal supplies various examples of innocents such as a school teacher, a housewife and a Siberian farmer. Felton sent a version of what Rolfe worked up to Ian Fleming, to gauge the author’s reaction and to see if he had any reactions or ideas. But Fleming would soon pull out of the project, selling his interest for a single British pound. U.N.C.L.E. would go on. 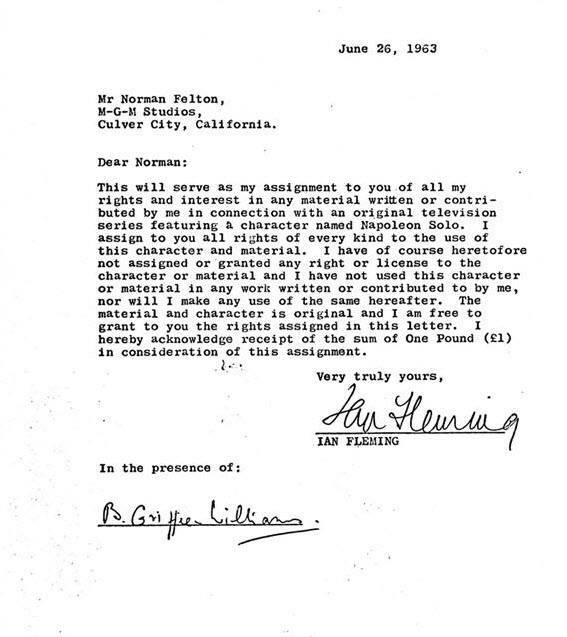 But Ian Fleming’s Solo (as this proposal was titled) had come to an end. 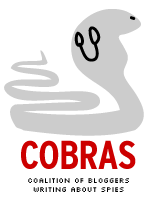 However, concepts in the presentation would evolve.